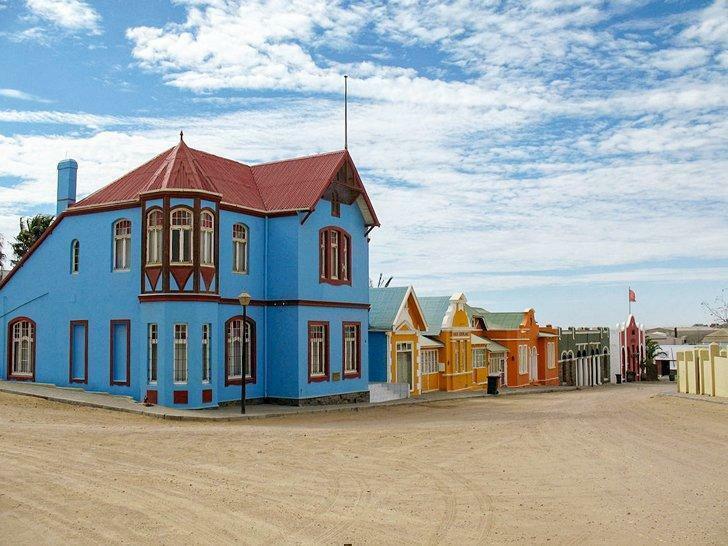 A Bavarian-style city may not be what you expect to find in the southern part of Africa, but Luderitz, Namibia has plenty of surprises. Claudia shares five of the best things to do in this unique African destination. All travellers would agree visiting Luderitz is one of the top things to do in Namibia. Located in the south of the country on one of the most inhospitable coasts of southern Africa, this small town of around 18000 people which was founded in 1883 and named after the person who had purchased the land where it was built, catches visitors by surprise with its colonial architecture and its Art Nouveau buildings. In other words, it feels completely out of place, and just plain weird. Because frankly, you would hardly imagine finding a town that would sit comfortably in the background of South Bavarian mountains in the desert of Namibia. There’s little doubt as to why it’s called Little Munich, indeed. 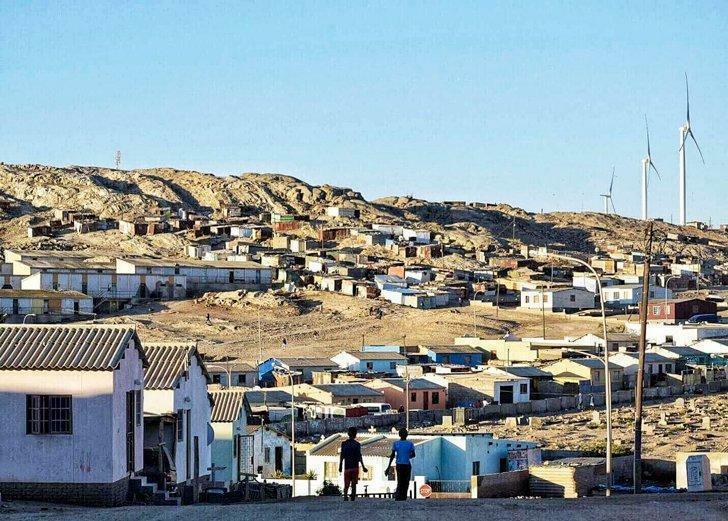 Weird, quirky yet incredibly interesting, terribly cold, and strangely humid despite the vicinity of the desert, Luderitz is enjoyable, and you’ll be glad to spend a couple of days there, visiting the city and its surroundings. 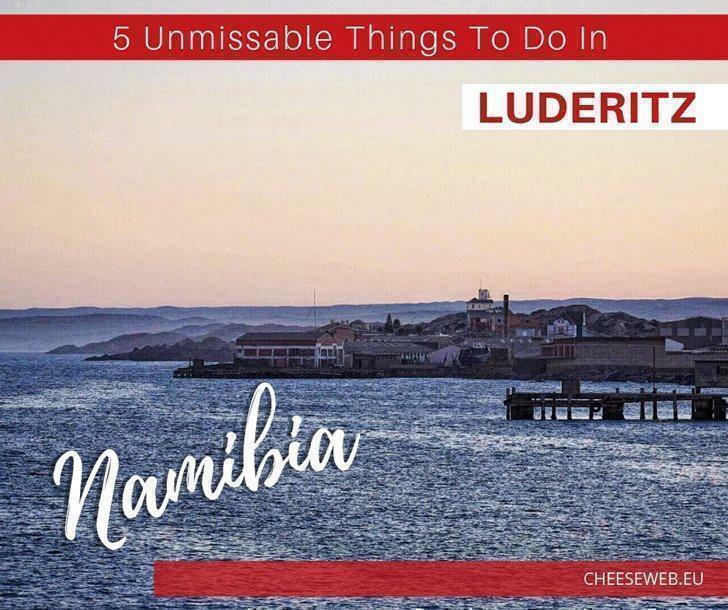 Here are five things you absolutely must not miss in Luderitz. Examples of colonial architecture and Art Nouveau buildings are scattered around Luderitz and can be easily seen on a walk around town. The Deutsche Africa Bank building, which dates back to 1907, is the most important colonial building in Luderitz and a national monument. The Felsenkirche, or Rock Church, is located on Diamond Hill: it’s a vertical gothic style church that was consecrated in 1912 and declared a national monument in 1978. The best views of the church are from the Luderitz Nest Hotel. 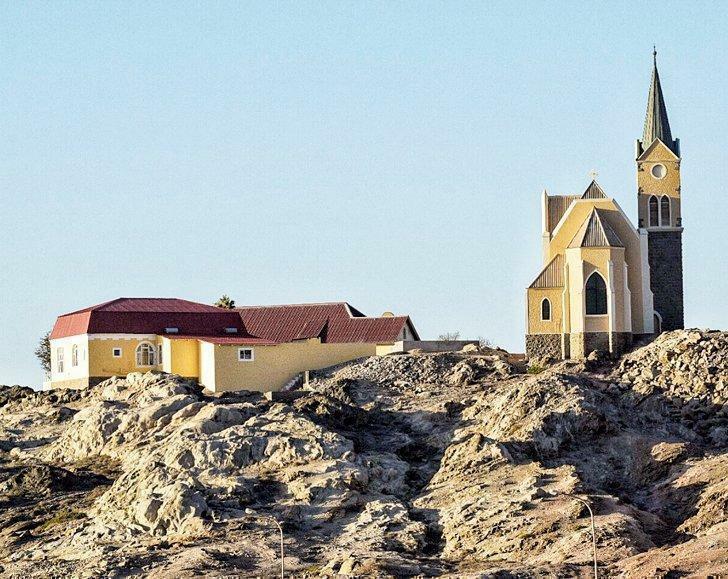 The Rock Church dominates Luderitz, Namibia’s skyline. Other beautiful colonial buildings are the Gluck Auf, built between 1907 and 1908. 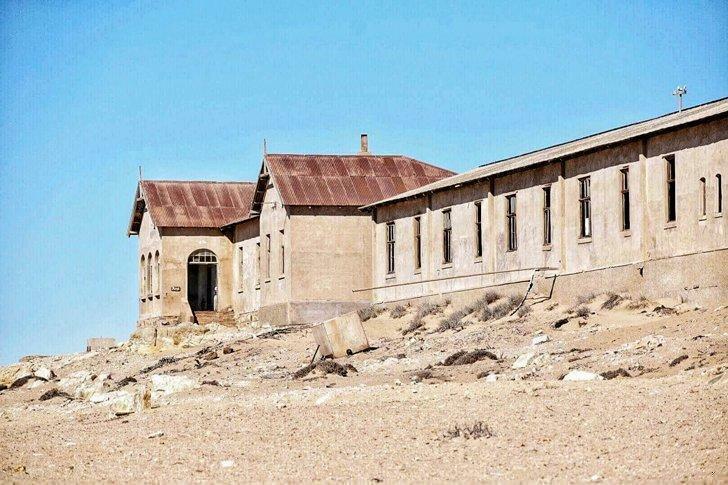 It was built for a lawyer employed by the diamond companies of the nearby Kolmanskop (more on this in a bit), and it became a national monument in 2014. The Goerkehaus was built between 1909 and 1911 and belonged to Hans Goerke, manager of the diamond company – another national monument. The Kreplinhaus, another national monument and built in 1909, used to be the residence of the first mayor of Luderitz, Emil Kreplin. Lastly, the Railway Station is another beautiful colonial building: it dates from 1904 and like the other buildings mentioned is now a national monument. Perhaps not one of the most obvious things to see in Luderitz is visiting the local township. A guided tour is a good way to get a better understanding of the relationship between the various communities that live in this part of the country. One thing to keep in mind is Namibia was actually part of South Africa until 1990 and apartheid was applied here too. Much like in other townships in Namibia and South Africa, the living conditions here vary greatly from place to place, with some examples of government housing next to modest huts built with whichever material is available. 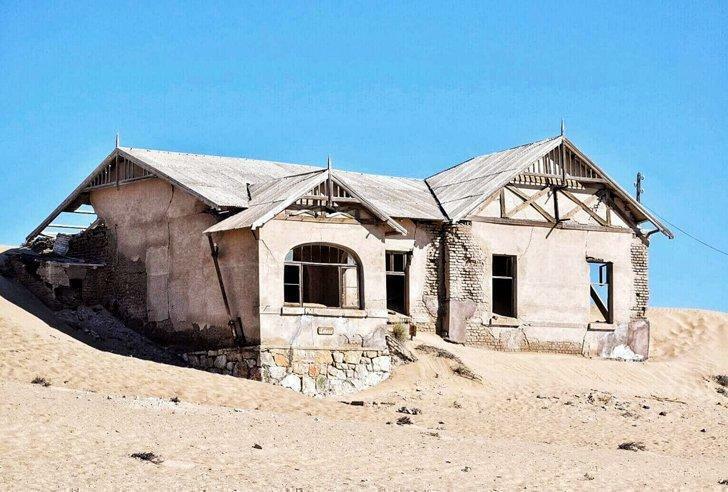 Once a mining town and now completely abandoned, Kolmanskop is about 10 km from Luderitz. It was founded at the very beginning of the 20th century when diamonds were found in the area. Kolmanskop was a tiny town, yet extremely rich and with great infrastructure. There were beautiful mansions, a general store, a post office, a bowling alley (which is still functioning), a restaurant, and even a train station – with carts that went around the village, taking the inhabitants to the center. Right outside Kolmanskop, there are some small buildings where mine workers were put in quarantine once they were due to leave town: it was a system put in place to avoid thefts of diamonds by way of swallowing them. 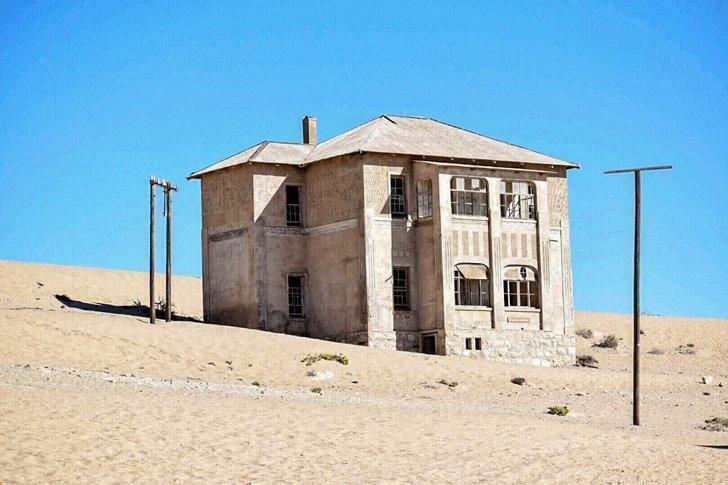 Kolmanskop was abandoned almost immediately when it was no longer profitable to mine diamonds in the region, and the industry reverted to South Africa for better places. 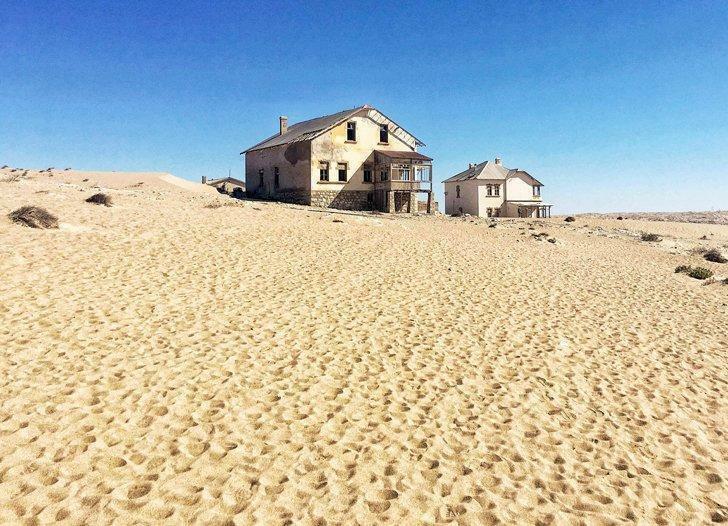 Inhabitants left most of their belongings behind, and Kolmanskop became a ghost town with beautifully preserved buildings that have at times been completely overtaken by the elements (namely: sand and wind). Kolmanskop can be visited on a guided tour, which usually lasts around 45 minutes, after which visitors are free to walk around and take photos. Bartolomeu Dias arrived in the bay of Luderitz in 1487 and named it Angra Pequena. 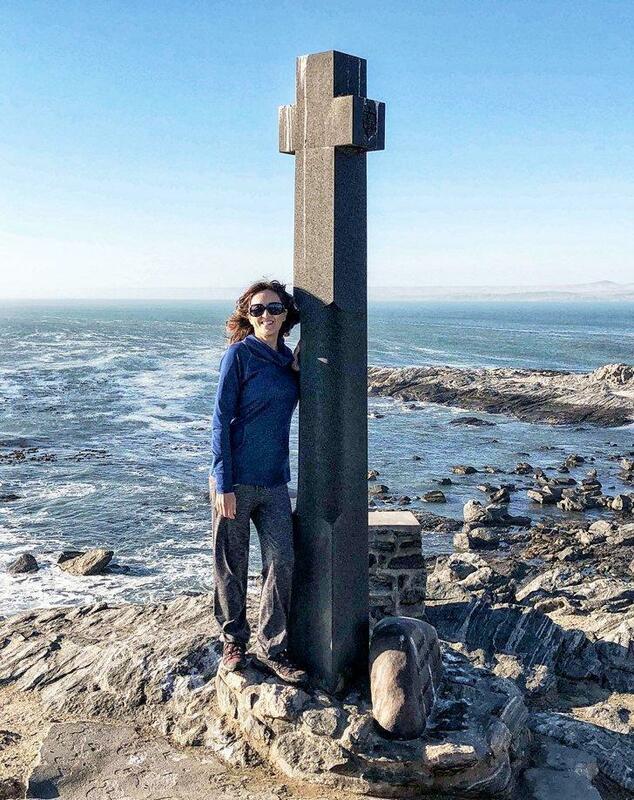 He then erected a stone cross in the southern peninsula, around 18 km from where Luderitz was founded centuries later. The cross is still visible today, and is one of the landmarks of this part of Namibia. You can walk up via a wooden causeway, which isn’t in very good shape to be honest. But the views of the Atlantic Ocean from there are breathtaking. 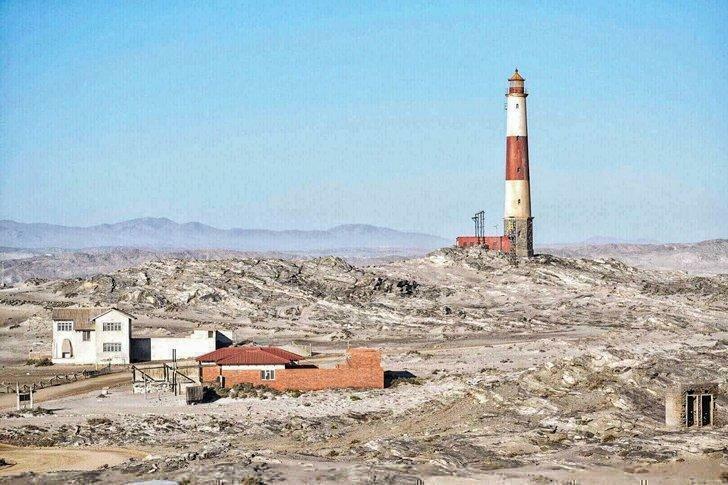 The lighthouse at Luderitz Peninsula. The area around Luderitz is packed with wildlife. 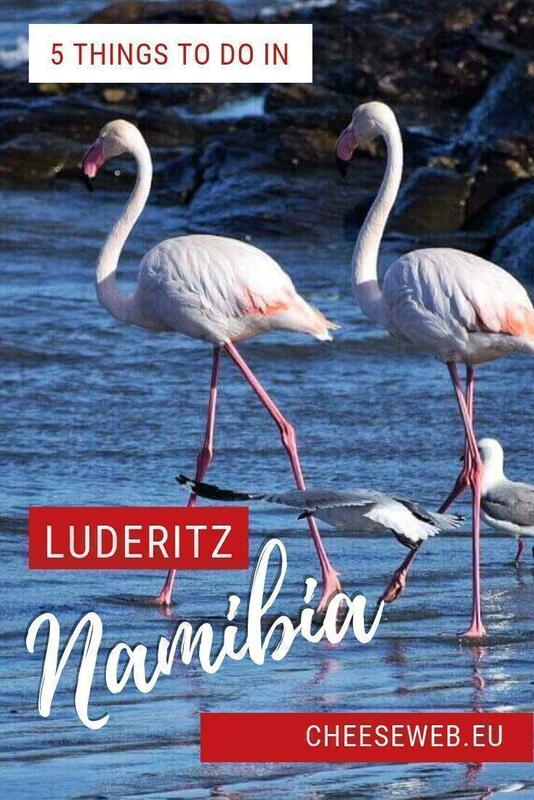 A short drive from Luderitz, the Luderitz Peninsula is a fabulous place to visit for birdwatchers. 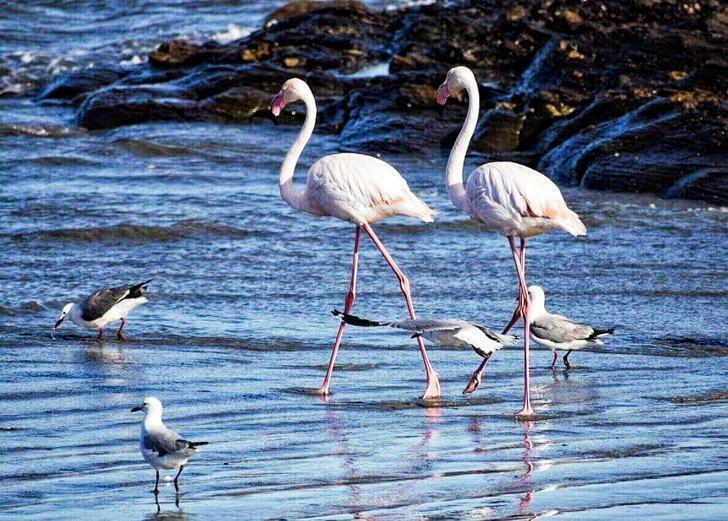 The best sighting is that of pink flamingoes, who feed on small fish and shrimps they find on the pristine beaches and waters of the peninsula. 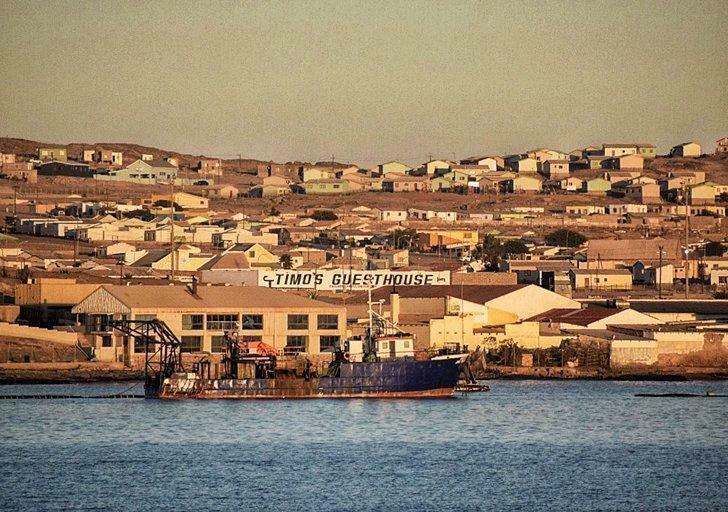 There are several good accommodation options in Luderitz. I don’t recommend camping, as the Atlantic currents and winds and the high levels of humidity mean very cold nights. The best Luderitz accommodation option is the Luderitz Nest Hotel, which has fantastic views of the ocean and an excellent restaurant serving delicious fish and seafood. Most people who visit Namibia either join an overland guided tour or rent a vehicle. It takes about 8 hours to drive from Windhoek. Luderitz also has an airport about 9 km from town: Air Namibia has weekly flights to Windhoek. Claudia Tavani is a former human rights lawyer who abandoned her academic career to pursue a life of travel. 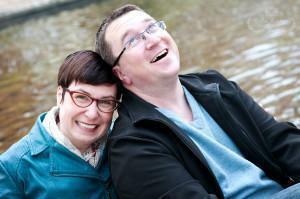 Through her blog, My Adventures Across The World, she shares travel tips and goes on an occasional rant.